An unusual tea house in Marrakech is nestled between the Hivernage cafés, across from the Palais de Congrés on Avenue Mohamed VI. They specialize in designer teas, which you can enjoy in designer surroundings in this Moroccan Imperial city. The Tchaba Tea Company was founded in the United Arab Emirates to bring high-quality health teas to the tea-drinking population. 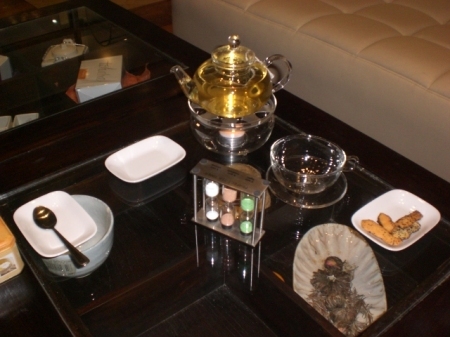 First in Dubai and Abu Dhabi, the company has now opened a tea salon in Marrakech. 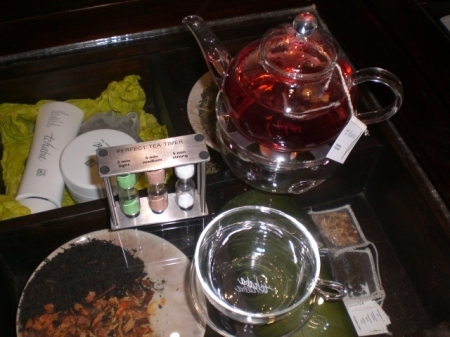 Teas are presented to customers using tiny hourglasses of colored sand, each color being used depending upon which type of tea is being served. Over 50 different kinds of teas, manufactured in Morocco and shipped all over the world, are displayed and sold in the tea shop. Each tea bag is made from silk, and contains only the finest tea leaves, herbs, fruits, and spices. Both of the teas we had (above and below) cost 35 Moroccan dirhams each (about $4 USD). 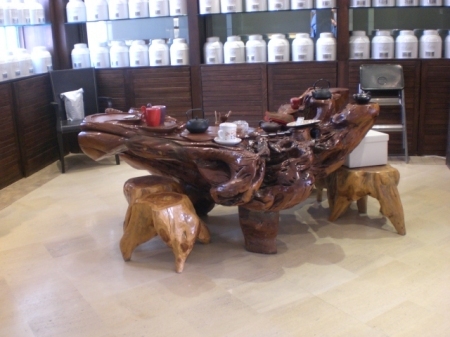 Teas are served either at tables and chairs, or on lovely glass display tables as you sit on white sofas. Customers are served tea in glass teacups, from a glass teapot on a special warming stand, with accompanying sweet biscuits. You are currently browsing the archives for the Marrakech Historical Tour category.